It isn't enough unfortunately to just vote or even encourage others to do so. While it is important to take steps to be sure YOUR vote is counted,WE also have to be concerned about the votes of millions of other people being counted as well. We really are in this together. Your vote and others perhaps in an upscale community, who don't have to wait in long lines or worry much about intimidation and not at risk of being purged, STILL need to consider the BIG PICTURE! Please chck the link above and this one also if you would like more important information. 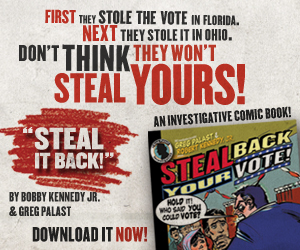 http://www.gregpalast.com/sbyv/ downloadable comic book/guide and of course: http://velvetrevolution.us/ for updated reports and ACTIONS !